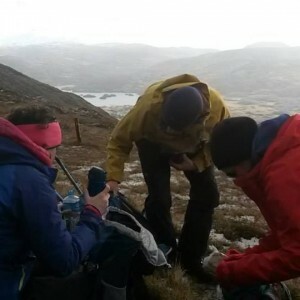 The Mountain Skills Assessment is held over two days. After completing a short written test and equipment checked, you will be given a full opportunity to demonstrate your skills and knowledge through a practical mountain journey. This will include a 2-3 hour night navigation at the end of the first day. Assessment Duration: 2 days and includes night navigation assessment. What is the Mountain Skills Assessment? MS Assessment is held over two days, and comprises both written and practical evaluation, including a night navigation exercise. 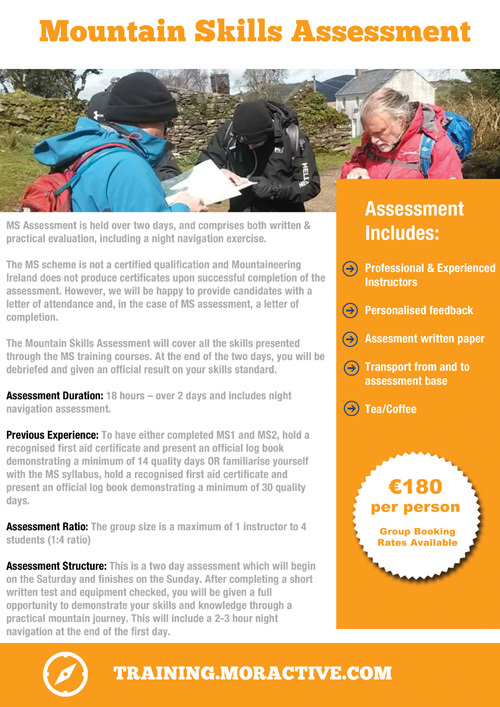 The MS scheme is not a certified qualification and Mountaineering Ireland does not produce certificates upon successful completion of the assessment. However, we will be happy to provide candidates with a letter of attendance and, in the case of MS assessment, a letter of completion. The Mountain Skills Assessment will cover all the skills presented through the MS training courses. Throughout the two days you will be given personal feedback and encouraged to gain further training experience. At the end of the two days, you will be debriefed and given an official result on your skills standard. 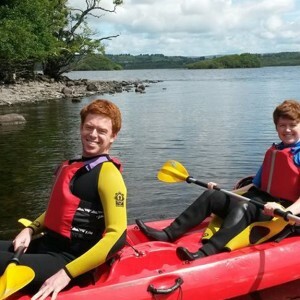 Previous Experience: To have either completed Mountain Skills 1 and Mountain Skills 2, hold a recognised first aid certificate and present an official log book demonstrating a minimum of 14 quality days OR familiarise yourself with the MS syllabus, hold a recognised first aid certificate and present an official log book demonstrating a minimum of 30 quality days. This is a two day assessment which will begin on the Saturday and finishes on the Sunday. After completing a short written test and equipment checked, you will be given a full opportunity to demonstrate your skills and knowledge through a practical mountain journey. This will include a 2-3 hour night navigation at the end of the first day. What To Bring On Your Assessment? The Mountain Skills Assessment is an opportunity for you to demonstrate your knowledge and personal ability of the basic hillwalking skills required for a safe and enjoyable journey within the hills of Ireland and the UK. Although set as an assessment process with a pass/deferral/fail result, it will also encompass an opportunity for further learning. To help make it a more enjoyable learning experience it is recommended that you ask yourself the following questions before putting yourself forward. Have you completed BOS Mountain Skills 1 and Mountain Skills 2 and also clearly presented evidence of at least 14 quality walks in this log book? Have you gained the required level of skill through experience and informal training and clearly presented evidence of at least 28 quality walks in this log book? 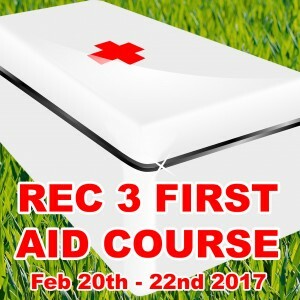 Evidence to present at assessment of valid and recognized first aid certificate? Do you have suitable personal equipment to look after yourself within the normal conditions found in the uplands of the UK and Ireland? Do you currently have the personal fitness to spend two full days hillwalking, including a night navigation session? Do you demonstrate respect for the mountain environment when you are hillwalking? 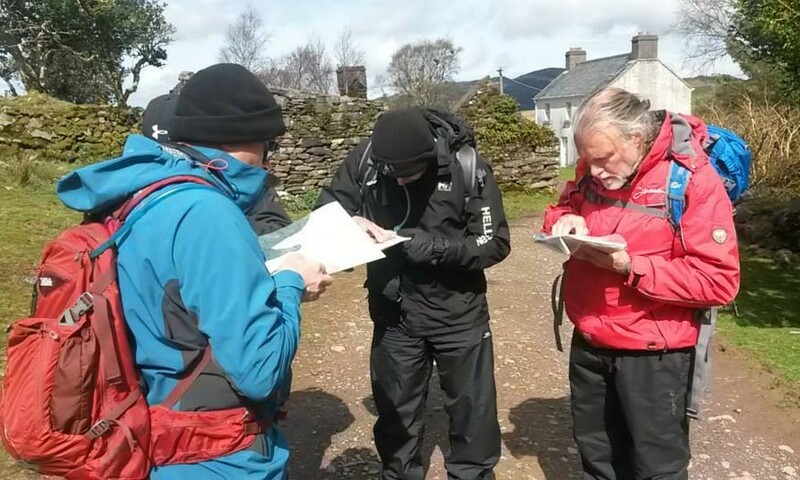 Are you confident in your ability to demonstrate any of the navigational techniques presented through the Mountain Skills syllabus? Are you confident in your ability to understand your own personal limitations and make due assessments towards safety when moving across steep/broken ground? Have you developed an interest and understanding of issues, past, present and future that have a bearing on hillwalking in Ireland? Are you looking forward to spending 2 days out with a group of like-minded individuals, walking, learning and getting an opportunity to show of your personal mountain skills?